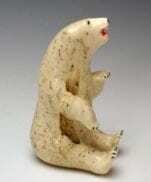 A fine bear carved from ivory. 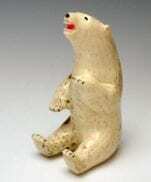 The "Genuine Ivory Eskimo Made" label places it in the 1950's or 1960's, at the latest. Black scrimshaw in the snout, eyes, and claws. Red pigment in the mouth is another indication of age. Very good condition, with expected wear in the scrimshaw. 3 1/4" high x 2 3/4" deep x 1 1/4" wide Because of marine mammal protection laws, this item can only be shipped within the United States.